On SHOWstudio, in a head to head discussion with consultant Mimma Viglezio, fashion historian Colin McDowell branded Mrs. Prada act “hypocritical,” given the extremity of world issues experienced presently. 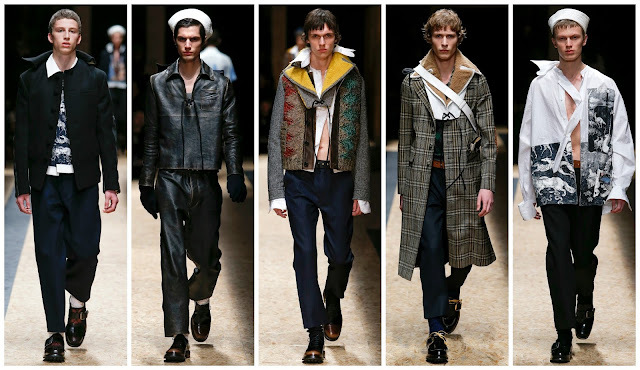 His valid points argue that these garments which come equipped with a cool, couple thousand euro price tag are wildly removed from the concept at hand. Provocations are Mrs. Prada’s forte, and this action has certainly divided audiences. Personally speaking, I do believe that it is hypocritical for designers to charge such high prices when referencing things like immigration. Denmark’s new laws that allows seizing valuables and delaying family reunions made headlines weeks ago. Things like this put into the question the rudeness of it all. Miuccia Prada has always been on the frontline of provoking via the medium of fashion. She’s in touch with her surroundings, and the world’s happenings. Though there is a nastier element to the discussion at hand, her designs this season tap into the broader cultural context that, when done correctly, enriches a collection. That’s what happened here. French artist Christophe Chemin was commissioned by the house to create prints for the collection. Two lovers passionately kissing as the stars descend for the sea, medieval townscapes, fantasy creatures and more appeared on shirts that are a commercial goldmine. However, they weren’t a copout. Or, at least, they were disguised well enough to not portray this underlying fact. An exercise in sumptuous tailoring was evident in the collection. A checkered trench coat (well worth the thousands of euros it will probably cost), and a shearling-lined blazer were two instant additions to my shopping list. One checkered piece was enlivened with blue shearling. The trousers this season were low-cut. The teenage models that wore them, though towering in height, perfectly embodied a teen growing out of old clothes. Sharply cut they were, and styled with matching the most beautiful coats and jackets. The styling was questionable, yes, but the vision was conveyed. Her awareness of issues at hand were weaved deftly into this collection, through sailor hats (obviously an allusion to the horrible crisis on Mediterranean waters), ankle-grazing, worn-in trousers, dishevelled appearances. Regardless of efforts, the world still remains a dark, dark place. But in the depths of humanities despair the so-called “frivolity” of fashion provides a beacon of light, a glimmer of hope. Miuccia Prada deserves a round of applause for returning some of that light.